While the sight of a yucca may conjure up visions of a dry desert landscape, far from the tropical landscapes bananas bring to mind, they are terrific plants for a tropical garden! Yuccas are native to the arid and dry regions of the Americas, where temperatures fluctuate greatly and the sun is bright and unforgiving. They can tolerate frigid nights and weeks without water. They come in many varieties, some have leafs that stand proud and sharp, some have leaves that are fold over gently, still others are variegated with stunning gold streaks. Each year a single stem will grow out of the center of the leaf mass, bearing beautiful flowers for a short period of time in early summer. It's important to keep in mind that while yuccas will do best in that one part of the garden you just can't keep moist enough for cannas and bananas, they still require regular watering until they are established. Once established only water when there is a prolonged dry period. 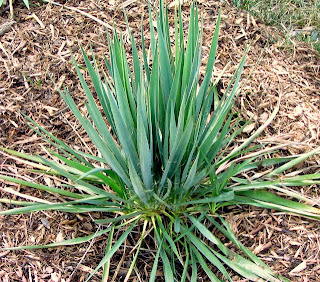 Make sure the soil is well drained and fertilize sparingly, the weeds will use it more than the yucca! After flowering, I prefer to let the stems on my yuccas dry completely before removing to minimize stress on the plant. Trim away dead leafs if desired, and leave uncovered in the winter to enjoy the look of a desert snow! The yucca is a nearly indestructible plant that is perfect for the tough care areas tropical garden. Give them a try! Great blog! (from a fellow tropicalesque gardener!) What types of yucca are you using? I just got a filamentosa, and have heard that flacida is hardy as well. I'll be trying musa basjoo for the first time this winter in chilly upstate NY as well.